Petals, I wanted to love this one so badly. I really did. As soon as it was sent to my precious little Kindle from NetGalley (thanks, publishers!) I stopped the book I was reading and dove into this one. I liked it. I really did. I just didn’t love it. Many of things I loved about A Bollywood Affair, Dev’s first book, are there. The rambling family, the amazing food, the detailed descriptions of the beautiful clothes, the way the book felt authentically Indian. All there. Sam from A Bollywood Affair even gets a brief shout out and I literally said out loud “oh, hi, buddy! How are you? !” because I’m vaguely pathetic like that. 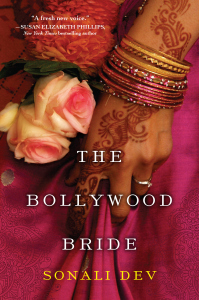 What I didn’t fully connect with in The Bollywood Bride was the heroine. Ria is a famous Ice Princess and a Bollywood star, but who in reality is like a duck. Calm on the surface but peddling furiously underneath. The Ice Princess persona means she can never be honest with anyone around her and she ends up carrying crushing guilt and giving herself emotional trauma because of it. Dev was clear about how Ria arrived at all her decisions, there were clear explanations as to why she thought she had to do what she did, but I still found myself wanting to shake her at so many opportunities. SO MANY. Largely because she needs some serious therapy and her emotional prison is one of her own choosing. The hero is Vikram, whose pent up rage at Ria is legitimate but also frustrating. I kept screaming at my Kindle “just freaking TALK IT OUT”. Their connection is so strong, I had a hard time understanding why we couldn’t add trust to that connection, especially on Ria’s part. Vikram’s anger was very understandable. Despite those frustrations, I really liked this book. The writing is sumptuous and the description of the wedding the story is largely based around is fantastic. I loved the interactions with the family, I loved learning about the traditions and the fabrics and the ways Indian culture translates in the United States. A totally different Indian immigrant experience than the one from Dev’s first book and I loved that she showed us a different side of this. The book, readers should know, deals heavily with mental illness. Ria’s mother suffered from advanced and untreated schizophrenia and Dev’s descriptions of her suffering and the suffering that caused in the life of her family are detailed. From my limited experience working with children of parents with mental illness, Ria’s baggage is authentic. As I said above, she has chosen this prison she’s put herself in, but the reasons she’s made those choices are clear. I just wish therapy was a culturally accepted thing, which because there is no mention of it, really, I’m assuming it’s not. As far as I’m concerned, there are only two drinks that be consumed when one is reading about India: chai tea or fresh lime soda. Since sometimes they’re difficult to come by outside the country (Starbucks Chai does not count, sorry petals), then a hot tea, G&T or a ice cold citrus soda like Fanta Lemon would do. India and Mental Illness: This NPR story from 2010 doesn’t really cover the stigma amongst the diaspora, but it is important to understand nonetheless. Bollywood for Beginners: If you’ve never watched a Bollywood flick, get thee to thy Netflix queue! This list provides a good starting place for those among us who are intimidated to know where to dive in. Another good starting place is Bride and Prejudice, which is a Bollywood treatment of the Austen classic and one of my favorite flicks. Contemporary, Mental Health, Religion, Romance, Tea, U.S.